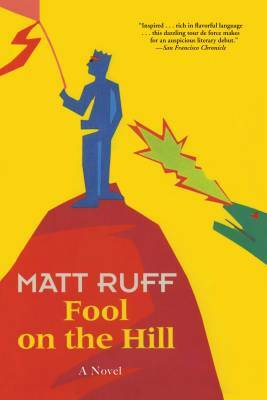 Fool on the Hill is a tale of two storytellers. The first is a retired Greek god, “Mr. Sunshine,” who in classic Greek god fashion creates “true fictions” by magically manipulating the lives of real people—a technique he refers to as “writing without paper.” The second is a lovesick mortal, Cornell University writer-in-residence Stephen Titus George, who finds himself cast as the protagonist in Mr. Sunshine’s latest drama and decides to challenge him for authorship of the story. Also caught up in the Tale are a mongrel dog named Luther and a Manx cat named Blackjack, who set out from the South Bronx in search of heaven and instead find themselves in Ithaca, New York; Aurora Borealis Smith, a Cornell student chosen by Mr. Sunshine to be George’s love interest and damsel-in-distress; the lady Calliope, last of the nine Muses and the most beautiful woman in the world; a group of modern-day knights known as the Bohemians; a secret society of elves and an evil army of rats; a deadly mannequin called the Rubbermaid; and a fire-breathing papier-mâché dragon destined to come to life on the Ides of March.